Teams struggling with insufficient or unfriendly output procedures inside leading publishing tools can use axaio MadeToPrint to speed up and to optimize their printing and exporting workflows through standardization. axaio MadeToPrint Auto allows fully automated print and export from your design document to one or more output targets. The automation process is based on an integrated hot folder support. MadeToPrint Auto includes connectors for vjoon K4, WoodWing Enterprise 7/8/9/10, Van Gennep PlanSystem4 and Quark Publishing System. Furthermore it can be integrated with automation systems such as Enfocus Switch. Typically, several teams simultaneously work on a large number of documents, against the deadlines! Today they still run into output flaws, misprints, issues with layers, etc… even with leading layout and publishing tools. 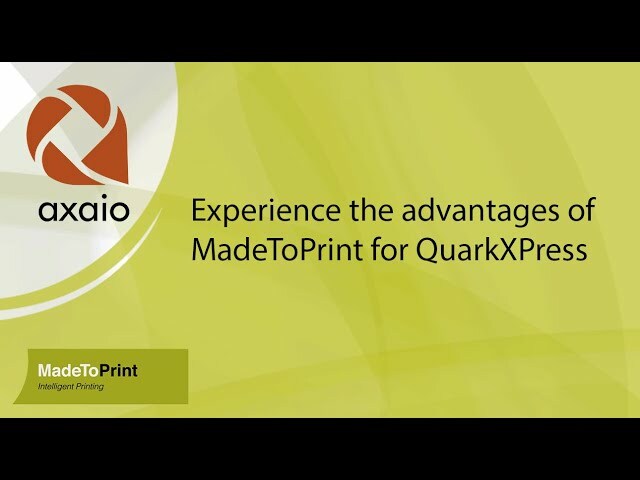 axaio MadeToPrint Auto and MadeToPrint Server solve current issues by automating, extending, enhancing, and streamlining printing and output processes. Predefined jobsets provide identical output from every file for increased efficiency, as well as considerable time and cost savings. MadeToPrint seamlessly integrates in any editorial system. Specific integrations have been made with the WoodWing Enterprise 7/8/9/10, PlanSystem4, vjoon K4 editorial systems and Enfocus’ Switch automation platform. Any publisher looking to standardize output in order to decrease cost and errors should have a look at MadeToPrint. Creative and production teams often struggle with insufficient or unfriendly document output procedures inside industry leading publishing tools. In comes the axaio MadeToPrint, the intelligent printing and exporting add-on to Adobe InDesign/InCopy/QuarkXPress/Illustrator. It relieves designers for all technicalities of preparing files for print. It solves output flaws, misprints, issues with layers … by extending, enhancing, checking and streamlining all output processes. Production managers can create output jobsets once, making them available to all users, to get identical output from every workstation with one mouse click. Today, Adobe Illustrator remains the tool of choice for the creation of packaging designs. At the same time, PDF is gaining popularity as the file format of choice for file exchange and review. With MadeToPrint for Illustrator, axaio provides a solution to automate PDF output from Illustrator with all the advantages such as cost savings and reduced errors. MadeToPrint for Adobe Illustrator is the perfect tool to automate the creation of different packaging versions, standardize file naming and increase output consistency. Once an output specification is set up in a MadeToPrint JobSet all files processed with that JobSet will consistently fit the same specification. It also allows you to extract all kinds of versions from the same master file, different language versions, low resolution for customer approval, a technical specification version for making the die cuts and more. Packaging designers and pre-press professionals are now able to create PDF files from Illustrator, without having to worry whether complex layer structures are correctly handled, or whether naming conventions and other production specifications are set correctly. Page range strings support more options, just like in InDesign. Post process scripts are also executed when there was a preflight error. New MadeToPrint Server UI for import configurations. Enable “Open PDF after export” even when Post Process is not chosen. Server UI shows remaining time of time limited licenses. Some options have not been saved to settings (e.g. when using the default value for a list). Choose folder dialog for Batch mode did crash. Radio buttons in run dialog were set incorrectly. UI update after job imported. New export mode 'Export to INDD file'. Auto mode can now process Photoshop, Illustrator and image files (JPG, PNG). Sort print- and autojobs in Configurations (customer based, brand based, …). Improvements in file handling (could not move files in some cases, Standard and Auto). Job list has filter/search Button to show in which job sets a print job is used. ENTERPRISEMETADATA can read from database. Auto mode hang with 0KB files in Hotfolder. File was not detected in Hotfolder. General Ticket Mode for Server versions. Documents could sometimes not be saved. Better detection of busy documents/folders when copied to Hotfolder. PDF export with large XObjects on master page is much faster now. Preprocess scripts can be executed per scope: job, page or layer. After installation settings from an previous InDesign version can be imported. When copying/moving files to a server the operation is repeated in case of failure (e.g. temporary loss of server connection). Book export: Layers can be exported separately. MadeToPrint-Jobs can be run via InDesign Shortcuts (First ten print jobs are listed in menu, can be ordered by rating). Compatibility with Adobe Creative Cloud 2014. Scanning of files for multiple jobs is much faster. Parameter Overrides: PDF/X-4:2010 can be chosen for Standard Compliance (is PDF/X-4:2007 for ID 5 - ID 7.0). Preflight report file is UTF 8. JPEG export handles transparency for correct output. TokenEngine: Token result can now contain apostrophe or quotes. SwitchMode: MTP_ID_Pre_StatusInfo.txt contains the right information. Fixed a problem with truncated file names for overwritten files on certain operating systems). Hotfolder can have priority. Higher priority hotfolders are processed completely before other hotfolders are scanned. PNG export can now use smoothing options. TIFF export can now use smoothing options. layer handling: Print layer views by name. Better handling of distiller processes. Better handling of PDF post process. pdfToolbox version is updated [pdfEngine 7.0.1 (252)] (more PDF profiles to choose from). K4 MetaData can now be accessed in K4 v6. Fixed bug in external library, which caused some installation to export false PDFs. Order of pages is exactly as in the page range string. Page range from jobticket can also be used for jobsets. Infobar preview is shown in InDesign CC on Mac again. Scaling and moving of page content when using Infobar works again. Preflight: Can search for missing links in specific folder. PDF output files can be opened by default PDF application (in standard mode). pdfToolbox Preflight has detailed report settings in PDFPostProcess. Page Range: in manual processing Ask token can be used. Preflight report contains both axaio preflight and InDesign Preflight report. In book mode pre- and postprocess scripts work on the book. Indexing output file doesn't change page numbering. If outputting separate layers, InDesign preflight is executed multiple times to ensure all layers are checked. Books are also preflighted when started manually, preflight works on the contained documents. Status information in jobticket was incomplete, out file is now O.K. When links are missing the repair function is called multiple times because InDesign may return wrong values. Some minor changes (logs, processing). Mac: better check if all files in a folder are ready (copying is done). Ringier is the largest internationally operating Swiss media company, producing more than 120 newspapers and magazines worldwide as well as running printing plants, several radio and TV stations and over 80 web and mobile platforms. In 1996, Ringier installed axaio MadeToPrint – at that time for Quark Publishing System. Since then, the software has been used first and foremost to create fully automated print data. This primarily consists of high resolution PDFs following the PDF/X-3 standard, but also includes lower resolution PDFs and thumbnails for downstream systems. By using MadeToPrint, Ringier saves 60 to 90 minutes of valuable working time per day. The software is very robust and reliable and its performance with the appropriate hardware is outstanding. axaio MadeToPrint is available in three different versions: MadeToPrint Standard (€349) is an InDesign plugin that allows you to optimize and safeguard the output of individual files in PDF format or other file formats. Using predefined JobSets, you can achieve identical output results on every workstation with a click of the mouse, thus ensuring a higher level of efficiency and fewer mistakes. MadeToPrint Auto (from € 2,490), is a plugin that enables a standardized, automated output from InDesign. MadeToPrint Server (from € 5,490) is based on processing with Adobe InDesign Server (included in the package). With the server version, output processes are fully automated around the clock to process high document volumes faster and more securely and meet the highest demands in publishing and printing environments. In the meantime all titles (“SI Style”, the “Glückspost”, “Landliebe”, “Schweizer Illustrierte” and the integrated newsroom of the “Blick Gruppe”) are produced with the server version of MadeToPrint. “The integration into our existing Woodwing editorial workflow was completely smooth and easy,” beams Martin Werren. “To help us get started with MadeToPrint, our system integrator provided support for our colleagues for a single day. Everything else could be set up gradually with internal resources. In combination with Woodwing Enterprise, nothing else on the market comes close. MadeToPrint is really efficient, flexible, and it meets all our requirements. Plus, we can count on very good 2nd level support from our integrator A&F and excellent support from axaio." With the massive changes in the publishing and media world, customer needs have of course also changed over the years. And Ringier has felt the shift from analog to digital media. Whereas before there was only “print”, now web, smart phones and tablets have been added to the mix. Ringier provides its services via all of these channels, keeping all of its people and lifestyle customers happy in the process. By acquiring other companies and making various investments, Ringier has been able to extend its field of expertise. In addition to publishing, Ringier AG has also established itself in the digital sector: internet-based and mobile e-commerce services such as shopping portals or Groupon services, and classified ad services such as car, furniture and job platforms. And that’s before we get to the entertainment sector, covering everything from TV, radio, events and entertainment services (ticketing, etc.). Ringier is the largest internationally operating Swiss media company, producing more than 120 newspapers and magazines worldwide as well as running printing plants, several radio and TV stations, and over 80 web and mobile platforms. Situated in the heart of Zurich, the Pressehaus has served as the headquarters of Ringier AG since 1978. Over 1000 employees visit this location every day. Together with its branches in Germany, Hungary, China,Vietnam, Romania and Africa, the company is comprised of roughly 8000 employees. With its 180-year history, Ringier stands for a pioneering spirit and individuality as well as independence, freedom of expression and diversity of information. The company’s hallmarks are excellence in products, journalistic quality and first-class entertainment. Founded in Switzerland in 1833, Ringier has been family run for five generations. 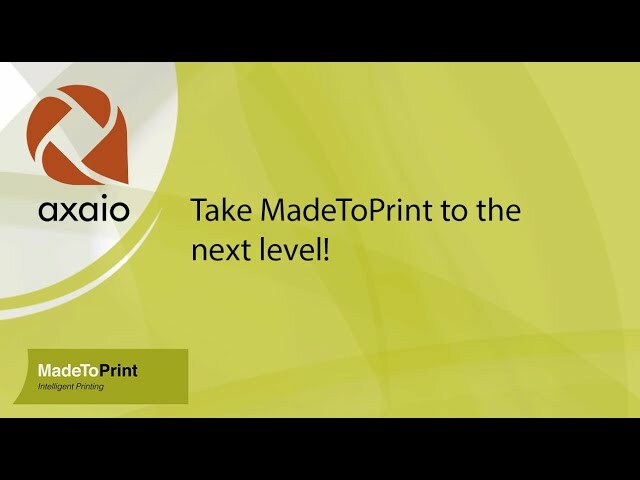 Webinar - Take MadeToPrint to the next level! David van Driessche, CTO at Four Pees, will be giving this English webinar about the advantages of MadeToPrint for QuarkXPress. At the VIP Event 2017, René Treuber (Product Manager of axaio) talked about taking MadeToPrint to the next level through using all of its features. There are several useful functionalities within MadeToPrint that are often not used in end user workflows. In this video some of these will be explained in detail and demonstrated step by step. Presentation - Take MadeToPrint to the next level! At the VIP Event 2017, Olaf Drümmer (CEO of axaio) talked about what MadeToPrint is and what it can do for you. 00:53 - Where did MadeToPrint come from? Creating output from Adobe InDesign or Quark XPress is not challenging. Consistently and reliably creating different pieces of output from InDesign documents for different targets, using a standard naming-scheme, output settings, output locations ... can be very challenging. axaio MadeToPrint is a plug-in for Adobe InDesign, InDesign Server, Illustrator, Quark XPress or InCopy that streamlines and automates the output from these applications to achieve a maximum of efficiency. 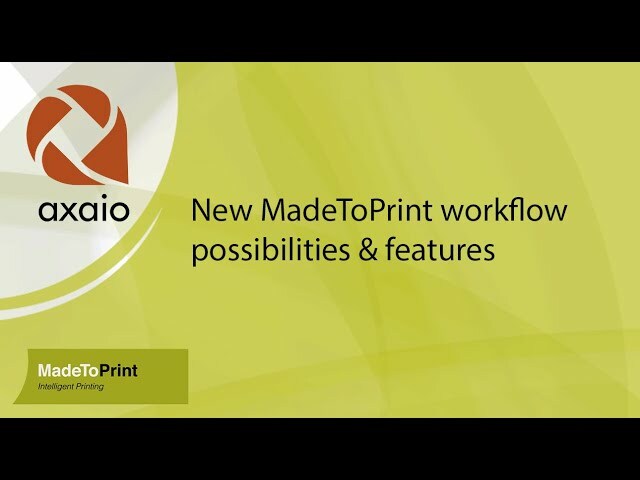 The webinar will provide an overview of axaio MadeToPrint with a demo of how flexible and helpful output processing with MadeToPrint can be. 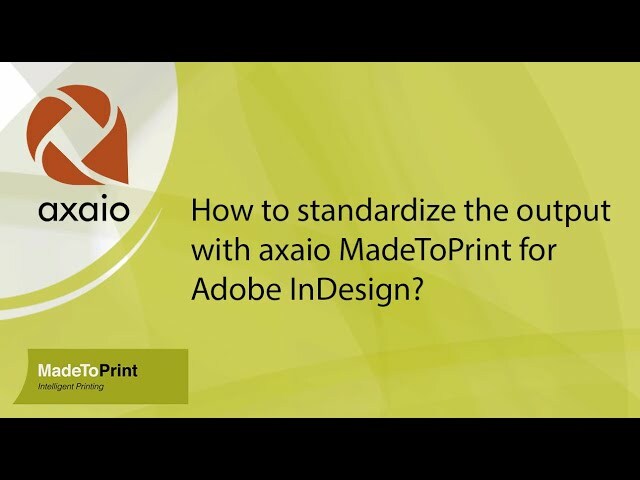 Presentation - How to standardize the output with axaio MadeToPrint for Adobe InDesign? This tutorial briefly shows how you can set up layer combinations in MadeToPrint to generate separate PDFs (or other output formats) combining different layers of your document. How to export a high resolution PDF, a low resolution PDF and an InDesign package at the same time? All you have to do is to create Printjobs for different output qualities/channels and then combine them into a jobset. Click on Edit to open the configuration dialog. In the configuration dialog create a new print job. From Destination pulldown choose File (PDF) and click on Setup... to choose the PDF Export preset. Choose your folder where you like MadeToPrint to export the final PDF to. You can use tokens to define dynamic folders which will be automatically created on runtime. The folders can be on the local hard disk or on any server volume which is mounted on this machine. As this job is an export job for a high resolution PDF you should enable the MadeToPrint preflight to ensure all linked images and fonts are available. After choosing Apply the MadeToPrint job is ready to use. Create another MadeToPrint job, this time we set it up to export an InDesign Package. Therefore create a new Job by clicking the same icon. Now we are creating a Printjob which creates an InDesign package containing all linked images and used fonts. as Destination choose "No Output" (which means that there will be no PDF etc created by this job). Activate the option to Create an InDesign Package. For package creation you have to manually package an InDesign file once! This is needed to initiate the InDesign packaging processor. This only needs to be done once for InDesign - after that you can create as many jobs as you want without the need to reinitialize it. Predifine the folder where the packages will go to. You can use token for generating date-based folders. You now can save the jobs. Simply repeat the steps from Create a MadeToPrint job for highres PDF export with some other settings to have a lowres PDF. Choose the Smallest File Size preset or any other that fits your needs. Choose another output folder where MadeToPrint should export the lowres PDFs to. You can choose the same folder as in the first job, but it should be clear what the PDF stands for. Click on the icon for Creating a new Jobset. Name it with a good name (1). You might also want to set a higher rating (2) so that this Jobset is at a top position in the list. After that go to the References Print jobs (3) section. Select the jobs you want to be executed (1) and submit via OK (2). Apply to save the jobs. You now can run the Jobset (when having a document open). Therefore select the Production jobset (1) and choose Print (2). PS: Jobsets can also be combined with autojobs to have automated (hot folder based) creation of different output versions. MadeToPrint will now create an InDesign Archive (1) with current date as folder name, a low resolution PDF (2) and a high resolution PDF (3) in one go. Choose a high res PDF Export preset in MadeToPrint. Tell MadeToPrint where to look for books. Therefore simply browse to your hot folders by selecting "Choose...". Tip: If you choose "Turbo..." you only need to browse to the "main" folder, MadeToPrint will then automatically create the subfolders "In", "Out" and "Error" and fill out the fields accordingly. Click Apply (1) to save the jobs and Close (2) to quit the configuration mode. Click Start to start the hotfolder monitoring. Drag the whole folder to the configured IN folder. As soon as the copying is finished MadeToPrint Auto will recognize the book and start exporting it to PDF. You will find your final PDF in the Result folder as defined in the MadeToPrint printjob (see above). With MadeToPrint, you can add a Post Process processing, which means that you can run a pdfToolbox profile on any output PDF you have created. You can not only create a grayscale PDF but also include a preflight to check against specific requirements or optimize your PDF for a specific output channel. Create a new Printjob (1) and name it accordingly (2). Choose destination File (PDF) (1) and click Setup... to choose the PDF Export Preset. In the main MadeToPrint dialog you now can choose your Grayscale PDF job an click on (Print). Starting with an easy sample document containing three different language layers (en, de, fr) and two layers with elements used for each language. You can automate this with MadeToPrint (Standard, Auto and Server) and the option "Print Layer Combinations". First, create a new job (1), give it a name (2). Afterwards decide (3) which printer or export you want to use. In the sample I create a PDF. Now (1) define the output file name with tokens. Add the layer name (2) to the filename to identify the document. If this is done, you can go to the layers (3) section. ...and choose "Print Layer Combinations". MadeToPrint has inserted the layer names of the document to the list of fixed layers. Fix Layers will be combined with each individual of the Per Document Layers to get multiple outputs. In our setup we want the en, de and fr layers to be "per document" (per PDF), together with the small and big car layers. Now small cars layer, big car layer and en layer gets exported to a PDF file, small cars layer, big car layer and de layer produces a seperate file, and finally small cars layer, big car layer and fr layer produces a file. Click on Apply (1) to save the setting and Close (2) to close the edit mode. Select your job (1) and click on Print (2). MadeToPrint is now exporting the document to seperate PDF files. Now you have 3 PDFs beside of your document. The destination of your output could be somewhere else, if you have set up a different location in the MadeToPrint job.